Quelaag's Domain is an area in Dark Souls and Dark Souls Remastered. 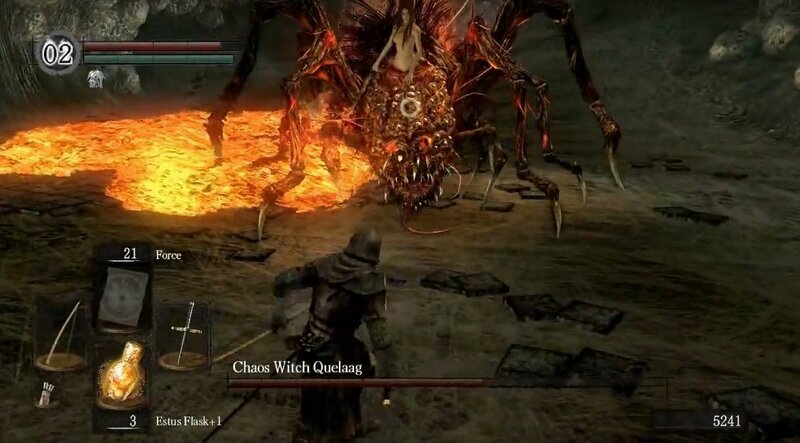 Accessed via Blighttown swamp and guarded by boulder-throwing Giants, it acts as a boss arena - Quelaag - and contains the second Bell of Awakening. Once you defeat the boss it also serves as the gateway to the Demon Ruins. Having arrived at the cave mouth from the swamps of Blighttown, enter Quelaag's Domain. Down the path you will find some unfortunate souls that have become Egg Carriers. They will not attack you and killing them will release some annoying maggot enemies, so it is best to simply ignore them. At the end you will find a fog gate and the summon sign for Maneater Mildred - if you are in human form and killed her during her invasion earlier on. Prepare your best fire resistant gear and any helpful buffs such as Flash Sweat, and then traverse the fog gate. Once Quelaag is defeated, continue in the same direction, up the stairs she descended. At the top, continue down the hall to find a circular room with a hole in the middle, a lever across the room from where you entered, and a doorway on the right. Pull the lever to ring the second Bell of Awakening and trigger a cinematic, showing the awakening of a Giantthat pulls a chain to open the gates to Sen's Fortress - our next destination. Now find the door that leads down a staircase, to a lower part of the bell tower. At the bottom of the stairs you will see a circular platform in the centre of the room and a hole in the wall to your left. Directly on the other side of the room lies an illusory wallthat leads to a secret area; If you're having difficulties finding the wall, the Orange Guidance Soapstone should give it away. Proceed to find Eingyi the egg carrierblocking the way - DO NOT kill him as he becomes a useful Pyromancy trainer. Talk to him and answer 'Yes' to his question and he will then get out of your way and allow you access to find a bonfire & the Daughter of Chaos, the Fire Keeper of this bonfire, so it will replenish 10 Estus Flasks with-out any kindling required. You may speak to her but only will you be able to hear what she says if you've acquired Old Witch's Ring; however, regardless of your possession of the ring, you may join the Chaos Servant Covenant through her. She can also reinforce your Estus Flask if you have a Fire Keeper Soul. Head back to the lower floor of the bell tower and have a look in the other hole in the wall down here. 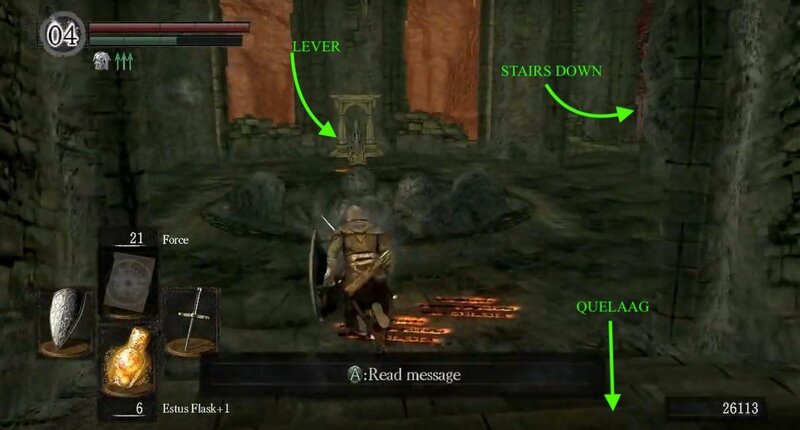 This leads down to the Demon Ruins; if you are a Caster, you might want to go down there and get the Gold-Hemmed Black Set (NOTE: Use the "easy way" described on the Ceaseless Discharge bossfight page to beat the boss even with starter gear). Afterwards, head back up and out of Quelaag's Domain, back to Blighttown swamp. Note: While back in the swamp, if you travel to the giant stone pillars that are closest to the entrance to Quelaag's Domain, you will encounter Quelana of Izalith sitting at the one on the far left. She appears after seeing Quelaag (whether or not you defeated her) or after having had your Pyromancy Flame upgraded to at least +10. She is a very useful Pyromancy trainer and can take your Pyromancy to new heights, as long as you have the souls. With the second bell rung, you can now enter Sen's Fortress. 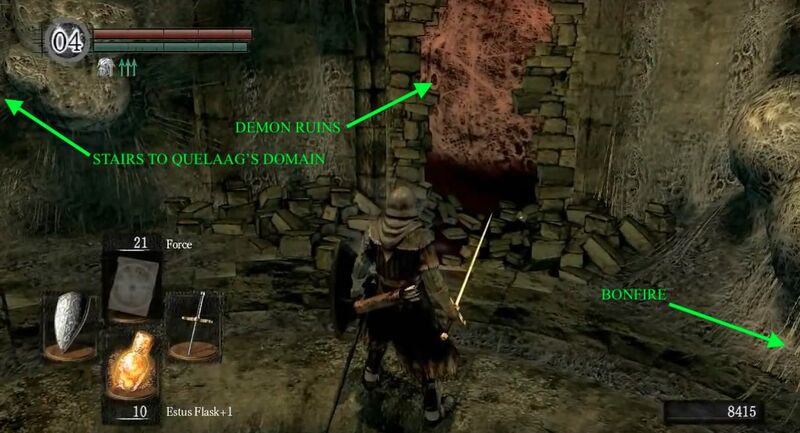 Quelaag's Domain was inspired by Demon's Souls' Stonefang Tunnel, and later inspired The Smouldering Lake of DS3. After ringing this bell of awakening before the one in the undead parish for experimental reasons, I can hear an invisible, intangible Frampt snoring at Firelink Shrine. Hurrah for science!